Pennsylvania trooper ambush: "It's an attack upon all of us in society"
BLOOMING GROVE, Pa. - With the deadly ambush on a state police barracks in the Pocono Mountains, law enforcement in eastern Pennsylvania went on high alert and officers from throughout the region, including New York and New Jersey, joined in a massive search for the shooter or shooters. After scouring dense woods on foot and by helicopter Saturday, authorities suspected the assailant had left the area. Investigators on Sunday returned to scour the woods across from the state police barracks where the attack took place. The probe comes as a nonprofit group offered a $50,000 reward for tips about Friday's deadly assault at the remote post in northeast Pennsylvania. So far, a suspect has neither been named nor caught. Pennsylvania State Police Commissioner Frank Noonan said the attack Friday night that left one trooper dead and another critically wounded was directed at state police and a "very dangerous, armed criminal" eluded quick capture. "This attack was an ambush. Our troopers were leaving the barracks and were shot without warning, and really had no chance to defend themselves," Noonan told reporters Saturday afternoon. "It's a cowardly attack. It's an attack upon all of us in society." Officials believe the suspect was looking to attack law enforcement, but they wouldn't say if the two officers shot were the specific targets, reports CBS Philadelphia. Law enforcement officers searched state game lands surrounding the barracks in Blooming Grove, in Pike County, and beyond Saturday. Several roads around the barracks, including parts of Interstate 84, were closed. "There has been an exhaustive search conducted by hundreds of members of law enforcement," said Lt. Colonel George Bivens. "We have canvassed the wooded areas, neighborhoods. We are convinced this individual is no longer in that immediate area." Police interviewed a man they called a "person of interest," but Noonan said authorities are talking to hundreds of people as part of the investigation. He stressed the man is not a suspect. Investigators told CBS Pittsburgh they don't know the motive. They're asking people in the area to be cautious. "I understand that many members of the community are concerned, and I wish I could lessen their concern, but we have a very dangerous armed criminal," said Noonan. Trooper Adam Reed, a state police spokesman, said the barracks covers most of Pike County, which runs along the Delaware River and borders New Jersey and New York. "There's a lot of rural area up where they patrol," he said. "As the primary police force in the county, they're going to respond to anything and everything." Dickson is the 98th state trooper to be killed in the line of duty. The troopers were ambushed around 10:50 p.m. Friday as one of them was leaving the barracks and another was arriving. Cpl. 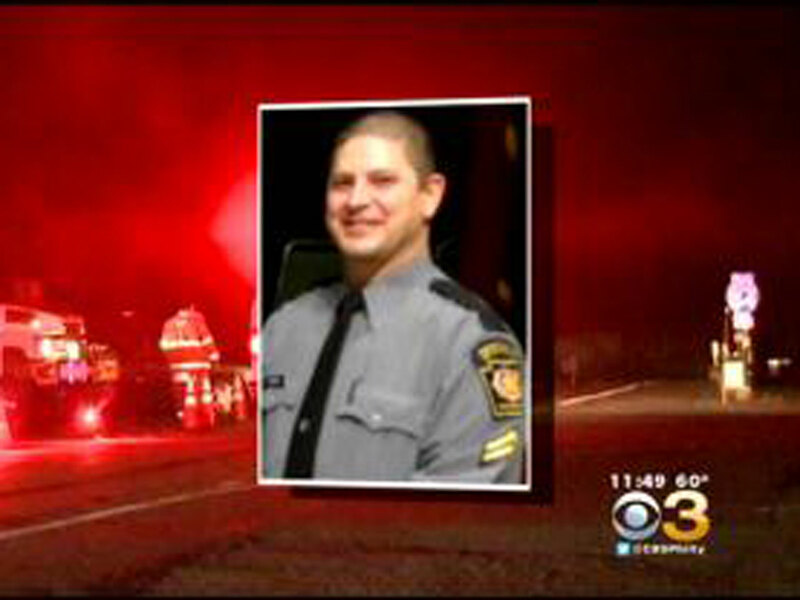 Bryon Dickson of Dunmore was killed and Trooper Alex Douglass was injured. Dickson, a seven-year veteran, had transferred to the region from the Philadelphia barracks several months ago. Taken to a hospital, Douglass underwent surgery and was in critical but stable condition, Noonan said. "It has touched us to the core that such a thing could happen," Noonan said. The slain trooper was married with two young sons. He was described by friends as devoted to work and family. "They were a committed couple," Melissa Contorno, a friend of Dickson's wife, told The (Scranton) Times-Tribune. "They were raising a beautiful young family. It's not fair." Blooming Grove is a township of about 4,000 people about 35 miles east of Scranton. State police spokesman Trooper Adam Reed said the barracks cover most of Pike County, which runs along the Delaware River and borders New Jersey and New York. Gov. Tom Corbett ordered all Pennsylvania flags at state facilities to fly at half-staff and said he was praying for the slain trooper's family as well as the injured colleague. He canceled all campaign appearances for the day. "The incident in Blooming Grove shows, once again, that our first responders face constant danger in order that the rest of us may live in peace and safety," Corbett said in a statement. "Cpl. Bryon K. Dickson and Trooper Alex T. Douglass are heroes who selflessly put their lives on the line every day for their fellow Pennsylvanians," said Pennsylvania State Troopers Association President Joseph Kovel.